The angled position of the slant board promotes better placement of the shoulder, arm and hand. It is therefore providing a better position to work on skills such as writing and drawing. The position of the board also brings the paper closer to the child and makes it easier to see. Placing a book or other reading material on a slant board may reduce eye strain. The child does not need to refocus their eyes as they scan through a page since all text remains at the same angle. 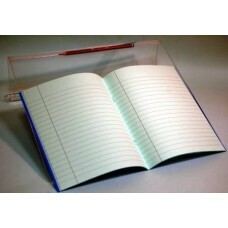 35cms width allows for open exercise book. Tougher design - less breakable. Set at the reccomended 20 degrees. The writing slope is easy to stack and store with a sturdy material and design. Slope dimensions: 35cms x32 cms.